Home / Light & Electricity / What are the Primary Colors of Light and What is Color Spectrum? What are the Primary Colors of Light and What is Color Spectrum? The colors of the rainbow are red, orange, yellow, green, blue, and violet. But these are not the only colors in the rainbow. If you look carefully at a rainbow, you can see that there are colors in between the red and the orange bands that are mixtures of the two. This is true for all the other main colors as well. The whole range of these colors is called the spectrum. The three most important colors of the spectrum are red, green, and blue. 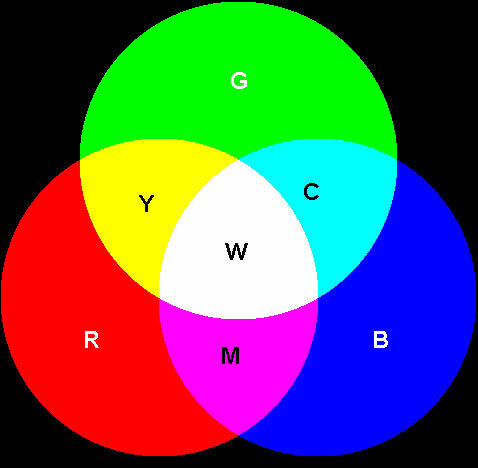 These are the primary colors of light. All the other colors you can see are mixtures of these three. If there are equal amounts of red, green, and blue light, you see this mixture as white light. Try to think of light as something that travels like waves. White light can be split up into different colors because each color is made up of waves of a particular length. The distance between the top of one wave and the top of the next wave is called the wavelength, and each color has its own wavelength. The color blue has the shortest wavelength. Red has the longest wavelength. When red and green lights are mixed, the result is yellow light. A mixture of blue and green light forms blue-green light, and blue and red lights form purple light. Combining all three primary colors in light in the proper proportions results in white light.